The blimp will be the first non-player or coach to be inducted. The Goodyear Blimp is heading to the College Football Hall of Fame, but it won't be there to provide aerial coverage this time. The blimp will be inducted as an honorary member. It's the first time that a non-player or coach has been inducted. The blimp has been providing aerial coverage for college football since the 1995 Rose Bowl came. Since then, its covered more than 2,000 games, achieving major broadcast firsts, including being the first to provide aerial footage of a major sports event and the first to provide high definition live video of a national sports game. "As the eye in the sky to college football's greatest coaches, players and moments, it's only fitting that the Goodyear Blimp joins the College Football Hall of Fame in a year when the game celebrates its 150th anniversary," said National Football Foundation chairman Archie Manning in a statement. 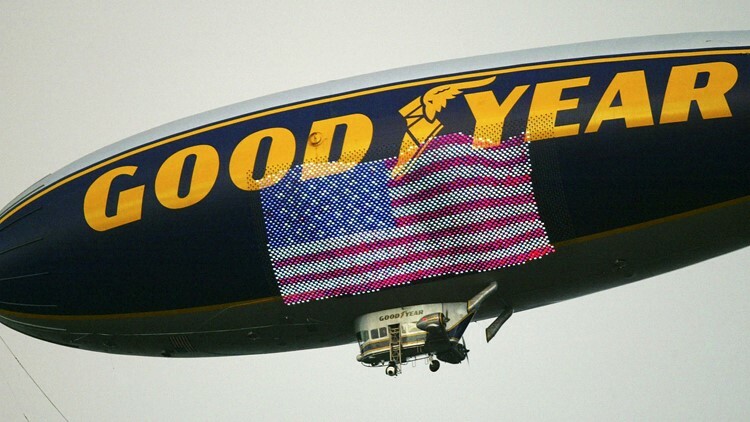 "Goodyear is proud that our iconic airship is an honorary member of the College Football Hall of Fame and will live in the company of college football legends," said Goodyear's North American general manager for brand marketing Todd Macsuga "The Goodyear Blimp has established itself as a symbol of the greatness that takes place on college football fields each Saturday." Fans of the blimp can learn more about its history at a new exhibit set to open later this year at the College Football Hall of Fame in Atlanta. The exhibit will include historical artifacts, video footage, pictures and more.